If this dog can’t make you laugh, just give up: You were born without a funny bone. Whether it’s his comical expression, barrel-shaped body, or just plain off way of looking at the world, it’s as though testing your ability to not crack a smile is what he was bred to do. Miniature Bull Terrier “Jet” by Bill McCreadie. 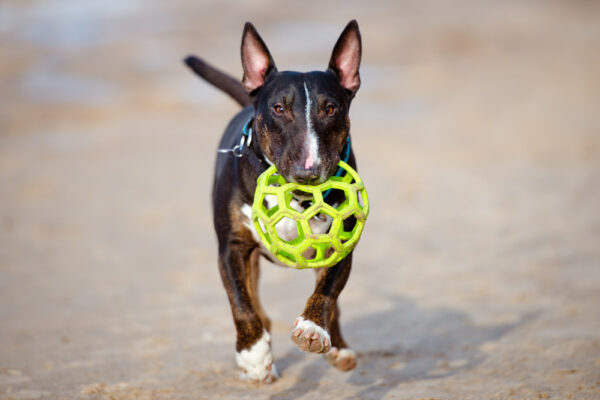 The Mini Bull Terrier may be confused with the American Staffordshire Terrier, American Pit Bull Terrier or Staffordshire Bull Terrier, but the Miniature Bull Terrier has a long egg-shaped head and erect ears. May also be confused with the standard-sized Bull Terrier, which is larger. You know, not miniaturized. This is a fairly new breed, derived from a kind of new breed, that goes back to a sort of old breed, that came from kind of older breeds. The older breeds it came from were the Bulldog and the old English Terrier. A cross between those two created a particularly good pit fighting dog, the Bull and Terrier (the sort of old breed). 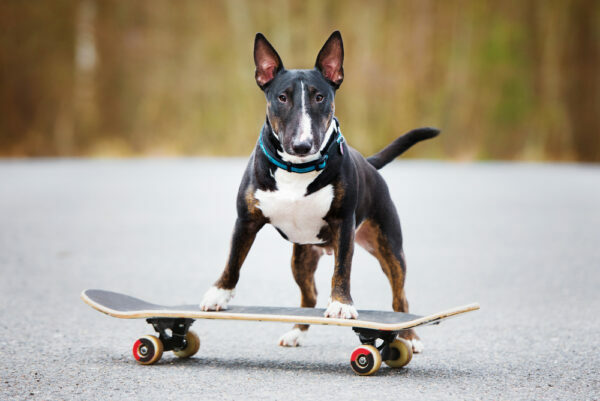 Miniature Bull Terrier by Shutterstock. 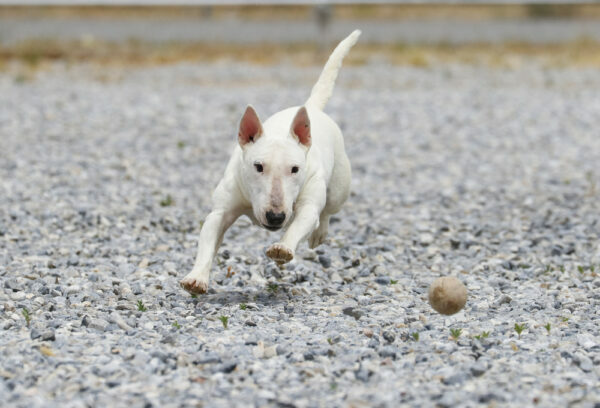 Around 1860, the Bull and Terrier was crossed with the white English Terrier and the Dalmatian, producing an all-white strain called the Bull Terrier (the kind of new breed). These dogs were sought after as stylish companions for young gentlemen. Bull Terriers came in a huge size range. At first they were separated by weight, but breeders made them so small they looked like Chihuahuas. In fact, Bull Terriers as small as 4 pounds were on record. These tiny ones eventually faded from the scene, but the slightly larger “miniature” was popular. A particularly famous line of “Toy” Bull Terriers, as the very small ones were called, were known as Covenwood Terriers after the kennel that bred them. 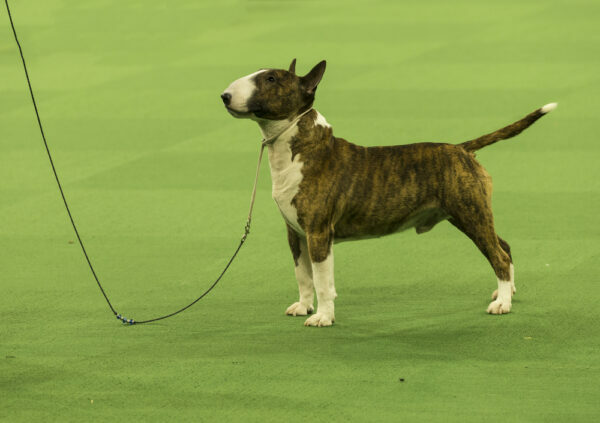 The AKC recognized the Bull terrier in 1885, but it would be over a century later before they recognized the miniature version. Meanwhile, back in England, the Minis were being shown, but World War I brought their numbers down, and their quality was notoriously bad. Their head looked like apples and their eyes bugged out, and they were too often tiny things. In 1918 the Kennel Club of England disavowed them. It would be 20 more years before a new club for them was formed. In 1939, they regained Kennel Club recognition. In the United States, the Mini was admitted into the AKC Miscellaneous group in 1963. Most breeds stay there for a few years while preparing for regular breed status. The Min bull was there until 1991. In the 1970s, the weight limit was changed to a height limit (14 inches), which encourages breeders to retain their robust physique. 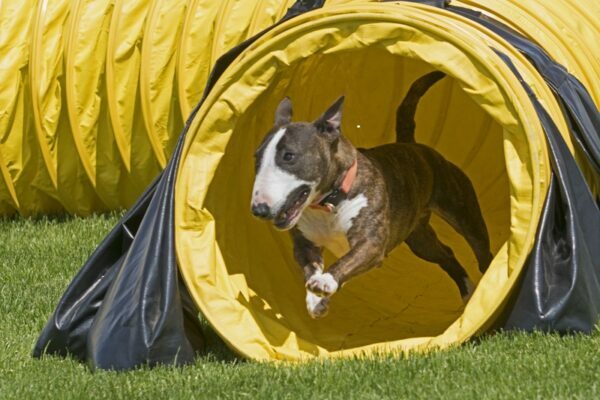 The Miniature Bull Terrier is the 125th most popular AKC breed, staying fairly steady at that ranking. The post Get to Know the Miniature Bull Terrier: A Comical Dog appeared first on Dogster.